Osprey Publications Ltd has released World War II Soviet Armed Forces (2) 1942-43 (by Dr. Nigel Thomas and illustrator Darko Pavlovic) as Number 468 in their Men-At-Arms series. This is the second volume of a three-volume series of Soviet armed forces during World War II. It is a paperback with 48 pages; included with the text are black & white photographs, color illustrations, information charts (tables) and detailed captions. The book is well-written and extremely detailed. I didn’t notice any spelling or grammar errors as I read through the book, which is a relief these days. Thomas covers the World War II Soviet armed forces during the timeframe of 1942-1943 very well. 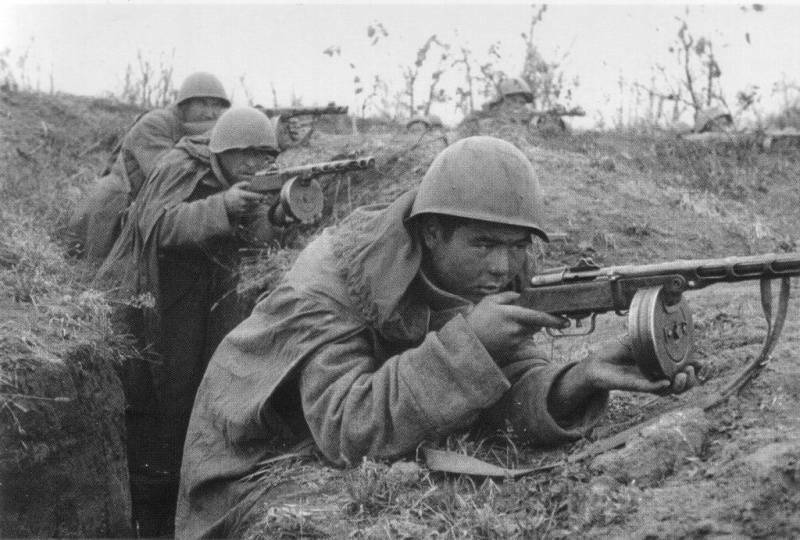 He discusses the different branches of the Soviet military, their areas of operations, the uniforms of the time, as well as specific individuals and their actions. It is obvious that the author has gone to great lengths to research all aspects of the Soviet armed forces during the period covered. Anyone interested in World War II Soviet Armed Forces, their areas of operation, and their uniforms and weapons will find this book very informative and interesting. There are a total of 36 black & white photographs throughout the book. Most of them are nice and clear, however, there are some that have an out-of-focus look to them, while others are too dark. Some of them are taken from film stills, which will account for their lack of sharpness. With that said, the quality of the photographs does not take anything away from the book. -	Armed Forces Commanders, 1942. The captions are well-written, and are very detailed. They explain the accompanying photographs well, and cover things such as the individuals and their units shown, the equipment and weapons, and the uniform items. Thomas also corrects mistakes that have been mentioned by other individuals when discussing certain photographs. All in all, I am very impressed with the book. It provides the kind of overview that all readers will find interesting, and I wouldn’t have any hesitation recommending it to others. Verdict: This is a very nice reference book that is well researched and written and contains nice photographs with well detailed captions. The color illustrations are very nice and will be very valuable to the military figure modeler for reference. Nice review Randy. I have to agree with Darren though- some copies of Osprey books have info about equipment on the back of the color plate- thats better. Having it at the end is rather annoying but still, not that big a problem. To me the wealth of different Soviet uniforms and insignia is confusing at times- I reckon this book would make it nice and clear. Cheers Harv. one needs these sort of books to get to grips with Soviet uniforms. There seamed to be alot of small changes to they're uniforms, would be a shame to model 1944-45 uniforms at Starlingrad. Don't know about the rest of the book, but just from the preview: "... carry blanket-rolls over their shoulder ..." (page 16, lower photo) Actually that is not a blanket. It is a greatcoat rolled like that. Here is another example of it: They also rolled waterproof cape (could also be used as a tent) like that, but it would be much flatter than on the photo from the book. Alex it is my understanding that the rolled tent squares where often used to store odds and ends in (even clean clothing) when rolled and so would no always look as indicated in the picture. Am I wrong in this belief? Thank you Alex I am very interested in the "1941 Red Army soldier field equipment manual". I have read quite a lot about the Russian infantry man and the equipment they should have, and I have several books on the subject dealing mostly with the soldier rather than the war in general. My belief was formed by various bits and pieces I have picked up from written material which indicated some of the habits that were formed by necessity rather than by design. I was not saying that it could never happen. I was saying that it seems very impractical to me. As far as the book, PM me with your e-mail address and I will send you the manual.